One glance at the visuals might make you think that this game was also released in 1971, but that’s not the case – it was simply designed like that as a faithful recreation of the original. While it does play like the original for the most part, certain changes/additions have been made to better fit the new zombie theme. 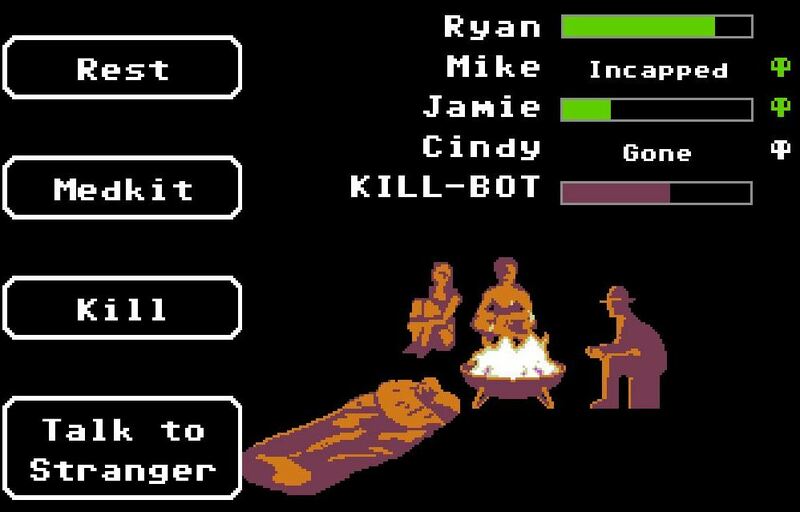 Just like in The Oregon Trail, you’ll be driving around a (station) wagon with 4 of your friends, scavenging for supplies and visiting towns in order to trade, help the citizens with various tasks and repair/upgrade your vehicle; zombies can be quite a nasty bunch after all. Anyone who’s seen horror movies with zombies know what getting bit by one means, and that’s also an issue in this game, so either you deal with it quickly or risk finding yourself on a nasty diet of human flesh and brains! Did I mention there are also zombie boss fights? Organ Trail: Director’s Cut certainly sounds like it has the makings of an interesting survival horror title; as unique as a zombie version of a 41 year old game can be. It’s available right now on Windows/Mac/Linux ($4.99), Android ($2.99) and iOS ($2.99) with its soundtrack residing on Bandcamp. The original version of Organ Trail can be played for free here and for more details, check out the official website.